The other night Joe took me out to dinner at a place called Frida’s (named for the artist). It’s an authentic Mexican restaurant that we found via a Groupon, in our area but had not been to. The menu was filled with wonderful food descriptions that were new to my taste buds. 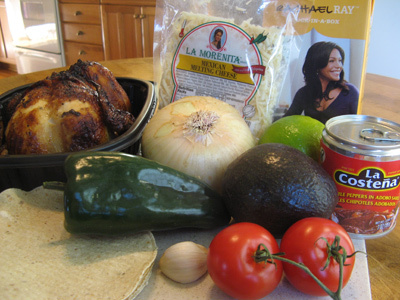 They used cactus, huitlacoche (a corn fungus which grows naturally on corn), achiote paste, wrapped chicken in Hoja Santa leaves, stuffed poblano peppers with apples, plantains and castillian nuts. They prepared dishes in a different way than my traditional New Mexican cuisine. We were treated with appetizers, 4 entree samples and a dessert. They started by bringing us Caldo Tlalpeno soup. Upon the first taste we were both impressed by all the flavors and that heat of chipotle that sneaked up on us. I started taking mental notes on what I was tasting and when we returned home I immediately started looking up this soup. I found that a lot of recipes included carrots, zucchini, and garbanzo beans. Frida’s didn’t include them and we loved it so much that I didn’t include them in my version either. Besides, Joe wouldn’t touch it if I included squash or beans. They placed the shredded chicken and Mexican cheese on the bottom of the bowl, ladled a broth with garlic, onions, peppers, slices of avocado and chipotle and topped with the tiniest tortilla strips and cilantro. I added some chopped fresh tomato and a lime wedge. It was perfect! Bear with me because I started laying out things that I wanted to include in the soup and then changed it up. I did use these items though. I was on the fly tasting and adjusting the amounts but it all came together in the end. I started with a rotisserie chicken. I picked it apart and shredded it. Only used the dark meat (about 2 cups) and saved the rest for another meal. I diced half an onion, 1 whole poblano chile, 1 tablespoon Chipotle en adobo sauce, a clove of garlic, Mexican melting cheese and broth. Tomatoes, tortillas, lime, and avocado topped it off. This soup starts with a tasty broth consisting of chicken stock, diced onion, diced poblano, minced garlic and some chipotle en adobo. I pureed the Chipotles en adobo then packaged them in a small ziplock bag to freeze the unused portion. Drizzle some olive oil in a medium stock pot. 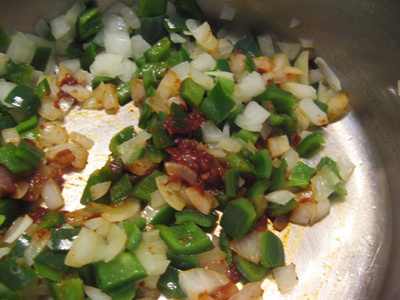 Add your onion and poblano and cook over medium heat for a few minutes until they soften and onions become translucent. 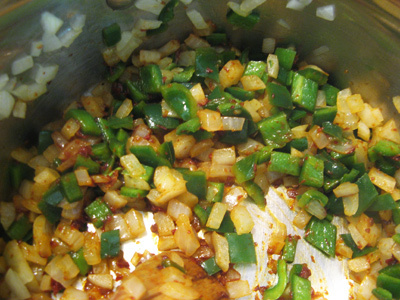 Add the tablespoon of chipotles and garlic. Give it a stir and continue cooking a minute or so until the garlic and chipotle become fragrant. Pour the chicken stock into the pot and continue cooking until it comes to a boil. Turn down the heat and simmer 10 minutes. One box of stock wasn’t enough, I added another 2 cups to sufficiently cover the veggies and fill the pot. 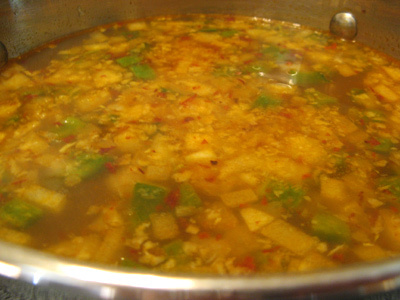 The aroma starts filling the kitchen when the soup starts to simmer. I took some kitchen scissors and cut 8 tortillas into tiny strips. I chopped the tomato, sliced the avocado and roughly chopped the cilantro to top the soup. And this Mexican melting cheese was originally going on top but I changed my mind and it went on the bottom of the soup bowl along with the chicken. While the soup is on simmer, I am going to fry my little tortilla strips and make them crispy. 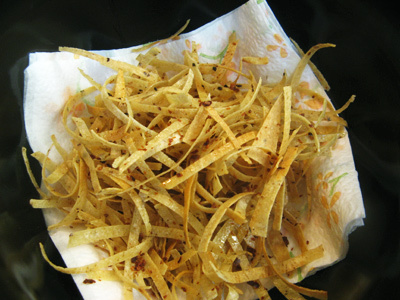 Drizzle some olive oil into the pan, get it hot and then toss a hand full of the tortilla strips. You’ll need to do this in batches. 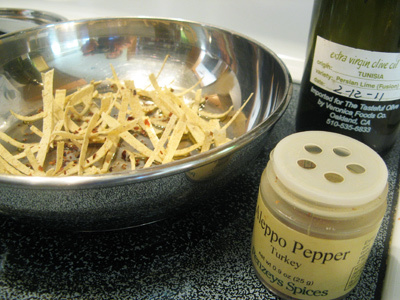 Sprinkle a little Aleppo pepper or other crushed red pepper flakes over top. I had some Persian Lime flavored olive oil from the Tasteful Olive that gave my tortilla strips a hint of lime. But unflavored olive oil works just fine too. When they start curling, toss them so that they fry a little on all sides. You will start to see a difference in color, toasty brown and that tells you they are crisp and ready. Lay them on a paper towel to cool and dry. And here’s the mound of tortilla strips all ready to top the soup. 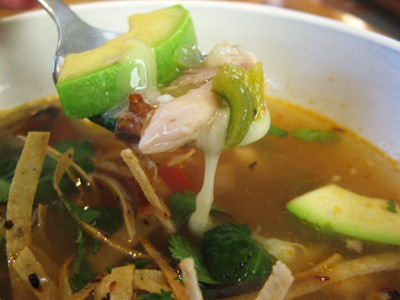 Place your chicken and cheese on the bottom of your bowl, ladle the brothy soup over top. 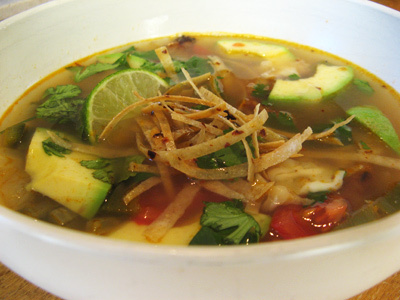 Add a few slices of avocado and chunks of tomato and top with the crunchy tortilla strips and cilantro. Squeeze a little wedge of lime if you like. Dip your spoon down at the bottom and grab some of that yummy chicken and cheese and anything else that will fit on your spoon. Pull meat from rotisserie chicken and shred enough of the chicken to make 2 cups. The rest can be used for another meal. 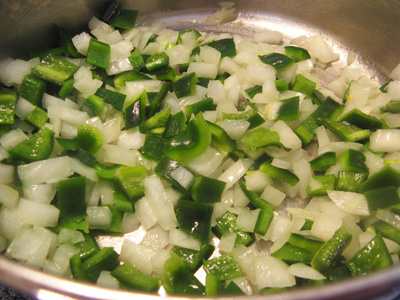 In a medium sized pot drizzle olive oil and add diced onion and poblano. Saute over medium heat until softened and onions become translucent. 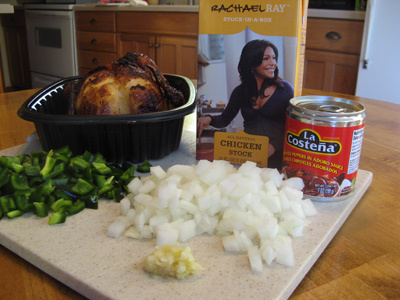 Add 1 tablespoon pureed Chipotle en Adobo and minced garlic to the pan. Stir and continue cooking for another minute until fragrant. Add the 6 cups of chicken stock, bring to a boil, then lower heat and simmer for 10 minutes. 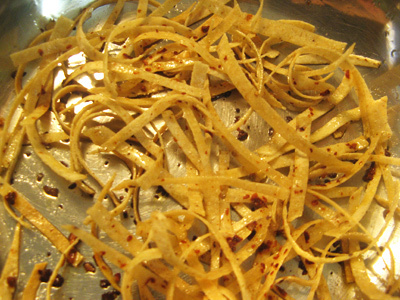 To make tortilla strips, drizzle olive oil in a heated pan and add a handful of tortilla strips. Sprinkle with Aleppo pepper flakes and continue frying until the strips start to curl. Using tongs turn them over until they have cooked on all sides. They will become crisp in just a minute or two. Transfer to a bowl lined with a paper towel to dry. Make these in batches. Using some paper towels wipe the pan clean of pepper flakes before starting again. The pan will be hot so use caution. 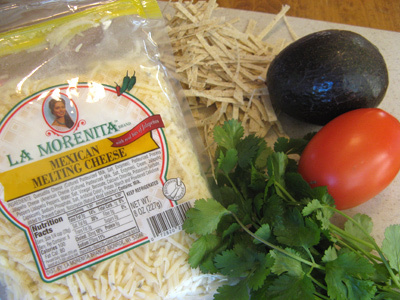 To assemble soup, layer desired amount of shredded chicken and grated Mexican cheese in bowls. Ladle soup and add a few avocado slices and chopped tomato. 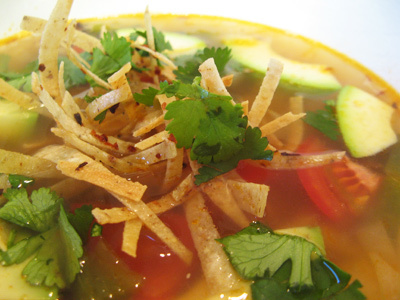 Top with crisp tortilla strips and cilantro. 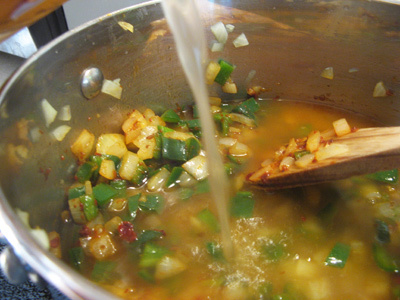 If desired, squeeze the juice of a lime wedge and add to the soup. I had this soup at a Mexican restaurant in Atlanta. It was a special Christmas menu item. It had Garbanzo beans in it and white hominy. Yummm. It was served with a small plate of additional garnishes. Lime wedges, chopped scallions, fresh jalapeno slices, and best of all shredded radishes. Crunch! There were a few other things but I can’t remember what they were. The flavors and colors just popped. I have looked for this recipe and this is the first time I have found it. Thanks for posting this. Your photos do justice to how fresh and colorful this bowl of soup looks. Thank you for the kind comments! I agree, the fresh garnishes make this soup so flavorful. At the time I was trying to re-create this soup from the flavors I tasted at the restaurant. I really like your idea of adding hominy, that sounds delicious!